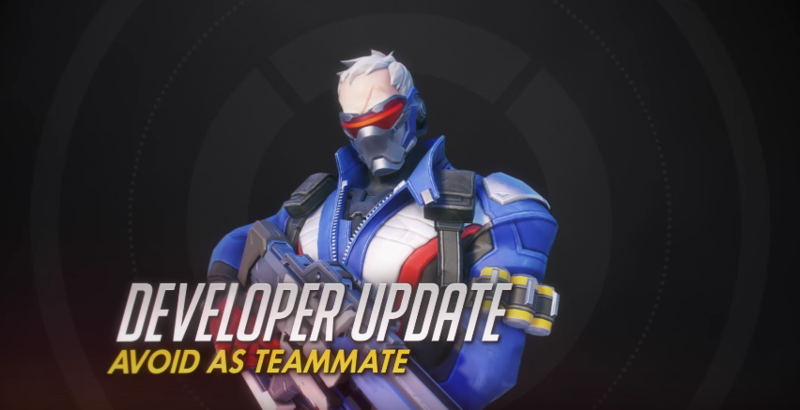 Overwatch developer update: Avoid as teammate – AiPT! One of the biggest problems found in online multiplayer games is toxic players ruining the fun for everyone else. While Blizzard has taken steps to address this problem in Overwatch with their report player system, players have been very vocal in requesting more be done to further combat the issue. Well Blizzard has responded to player feedback in a big way. Avoid as Teammate is the newest feature coming to Overwatch that will allow players to avoid being teamed with toxic players or people that just plain don’t get along with. Overwatch Developer Scott Mercer further breaks down the technology behind Avoid as Teammate and the decisions that lead to it’s implementation. With the release of Patch 1.22, I wanted to talk about the new and updated tools that can help players create a better and more positive gameplay experience. Before diving into those details, I first need to thank everyone who has been helping us identify toxic behavior. We have seen a steady increase in usage of the Player Report tool, and these additional reports allow us to identify and action toxic players more quickly and at a higher accuracy. Players have also been reaching out via social media with reports and videos of blatant toxicity, and we have investigated each of them and taken appropriate action. The best way for everyone to continue helping us combat toxicity is simple: just use the Player Report tool whenever you encounter bad behavior and give an accurate and detailed report. To help with the accuracy and clarity of reports, we are making a couple changes to the player report categories you can choose. The first change is renaming the “Griefing” category to “Gameplay Sabotage”. Griefing is a very broad term used in many different ways amongst the community. The intent of the category is to be used when a player disrupts the game or harasses other players through the use of normal gameplay mechanics. A clear example of this is Symmetra teleporter exits being placed at the side of cliffs so teammates immediately drop to their death. Another example is players intentionally allowing themselves to be eliminated by the enemy team. This is often referred by the community as “feeding” or “inting”. It is NOT gameplay sabotage if a player simply makes a mistake or has a poor match. Everyone does that from time to time, even the very best professionals in the world. Players can also have a rough match without a lot of mistakes, simply because the other team is making better plays and performing well. For a player to be reported for Gameplay Sabotage, they must intentionally be trying to disrupt and harass their teammates or actively trying to lose. Note that playing a non-meta Hero does not mean someone is taking part in Gameplay Sabotage. Players who are trying hard to help their team to win should not be reported, regardless of the hero they choose. The other change we’re making to the player reporting categories is removing the “Poor Teamwork” category. Many players were using this category in a very similar fashion to the “Griefing” category, because both categories could be interpreted very broadly to include diverse types of bad behavior. This made it more difficult for us to action players appropriately. The addition of the “Avoid as Teammate” option also gives players another way to improve their gameplay experience online. If you use the “Avoid as Teammate” option on a player, that action is will be effective in the next match. The matchmaker will no longer place you on a team with the avoided player for one week. Sometimes you don’t want to play with someone as a teammate because you disagree with their playstyle or hero choice. Sometimes your personalities or communication style simply clash. These can happen without either party being toxic. The use of Avoid as Teammates does NOT take the place of reporting someone for things like Abusive Chat, Inactivity, or Gameplay Sabotage. If you ever encounter a player being toxic, please take the time to report them for that behavior. It truly helps us make playing Overwatch a more positive experience. The feature isn’t available yet but will be in testing soon.